Late Wednesday night, the Cassini-Huygens spacecraft silently slipped through the outermost rings of Saturn and entered into orbit. By early Thursday morning, Cassini began transmitting strikingly elegant close-up images of Saturn's rings. Achieving orbit around the second largest planet in the solar system and transmitting images back to Earth is the culmination of a $3.3-billion, seven-year mission jointly run by NASA, the European Space Agency and the Italian Space Agency. The Cassini-Huygens spacecraft was launched from Kennedy Space Center in Cape Canaveral, Fla., on Oct. 15, 1997. The primary research goals are to learn about the planet Saturn, its famed rings, its largest moon Titan and other satellites. Although Saturn is not a rocky planet, like Earth or Mars, planetary geologists have plenty to look at. Six high-resolution images were combined to create this mosaic of Phoebe, one of Saturn's moons. Phoebe's surface shows many craters and an unusual variation in brightness. Researchers used to think Phoebe was a captured asteroid, but are now rethinking their interpretations. Image courtesy of NASA/JPL/Space Science Institute. A few weeks before the spacecraft reached Saturn, it made a close fly-by of Phoebe, one of Saturn's moons, and already researchers are ogling over the high-resolution pictures taken from only 1,300 miles away. "Frankly, I expected Phoebe to look like some of the other asteroids we have seen, but it really surprised me," says Rosaly Lopes, a planetary geologist at the Jet Propulsion Laboratory (JPL) in Pasadena, Calif.
Scientists at JPL now surmise that Phoebe is not an asteroid at all, but a small planetesimal that formed during the initial development of the solar system and was captured by Saturn's gravitational field. "Phoebe is a survivor," says Alfred McEwen, a planetary scientist at the University of Arizona, Tucson, and member of the Cassini imaging team. "It is the first good look we have had of a primitive small body whose birthplace is the outer solar system." The conglomeration of countless small bodies such as Phoebe led to the formation of the planets. Phoebe is only one of Saturn's 31 known moons. 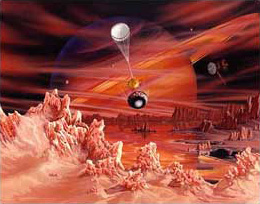 Much of the Cassini-Huygens research will focus on the crown jewel of Saturn's moon system  Titan. Titan is the second largest moon in the solar system, larger than the planets Mercury and Pluto, and roughly half the size of Earth. "This is a whole new planet-sized world," McEwen says. "All bets are off." This is an artist's interpretation of what Titan's surface may look like when the Huygens probe descends into the moon's thick atmosphere. A faint outline of Saturn appears in the background. Titan's surface may contain lakes of liquid ethane and methane. Image courtesy of NASA/JPL. On Christmas Day, the Huygens probe will separate from the Cassini orbiter and begin its descent into Titan's murky atmosphere. Preliminary images of Titan, sent back by Cassini on June 14, show the moon shrouded in a haze with dark and light patches. "They may be continents; there may be oceans of liquid on the surface," Lopes says. "Titan is still a mystery; it is probably going to be one of the most interesting objects we learn about." Once the Huygens probe enters the atmosphere, parachutes will slow its descent so instruments onboard can start sending data back to Earth. "Titan is like a snapshot of the early atmospheric chemistry of Earth," McEwen says. "It gives us insight into what the conditions were when life began." If everything goes well, the probe will eventually touch (or splash) down on Titan's surface, although scientists are unsure if the probe will survive  it was not designed for landing. "This is a situation where a whole series of things must happen for Huygens to make it," McEwen says. To maximize Huygens' chances, scientists have chosen a large dark spot on Titan, which could be a lake of methane and ethane, but researchers do not know, he says. Early Thursday morning, Cassini sent back this image of the sunlit side of Saturn's rings. Scientists hope to better understand the dynamics, composition and formation of the rings. For more images of Saturn's rings, visit the NASA/JPL official site. Image courtesy of NASA/JPL/Space Science Institute. Even if Huygens yields little geologic information about Titan, Cassini will fly by eight other moons in the next three years. Some of the more interesting lunar prospects are Iapetus, Mimas and Enceladus. Iapetus is divided into a reflective, possibly icy side and a dark mysterious side. "It is very peculiar; the leading side is the dark side and some researchers think it sweeps up dust," Lopes explains. Mimas is famous for its similarity to the "Death Star" in the Star Wars movies; a huge crater covers one-third of its surface. Enceladus is the most reflective of the moons and may be geologically active, with giant ice geysers shooting vapor particles into orbit. Some researchers believe that a faint ring around Saturn, called "ring E," is a result of these vapor particles, Lopes says, but there are many hypotheses surrounding the gas giant's rings. "The whole Saturnian system is dynamic, the interactions between the rings and satellites are particularly interesting," McEwen says. "Some believe the rings may be a large satellite that was destroyed  we're going to be finding out a lot more soon." 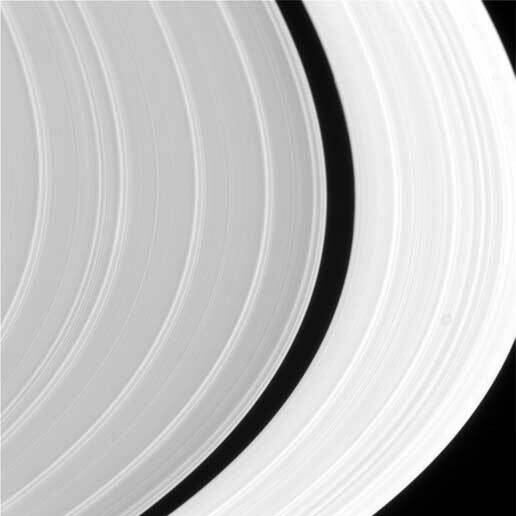 Scientists believe the rings are mainly composed of water ice, and the recent images should improve researchers' understanding of the rings composition. "These are the best images anyone has ever seen," Lopes says. The images are going to keep on coming. The Cassini mission is supposed to last four years, although the orbiter could be operable for up to 10. Scientists are particularly excited about the possibility of an extended mission. When the four-year term is completed, if "NASA declares the mission a success and lets the scientists make riskier maneuvers," McEwen says,"there are a lot of things we could do." Editor's note: A short version of this article appeared in the August issue of Geotimes.